There&apos;s been an update: an organisation will take over the project but we need to fund a 6 month extension to enable this to happen. A local businessman has pledged to match fund anything raised. We&apos;ve started a Crowdfunding page so even if all who signed this gives just £1 we can keep the gardens going for the 16 users. 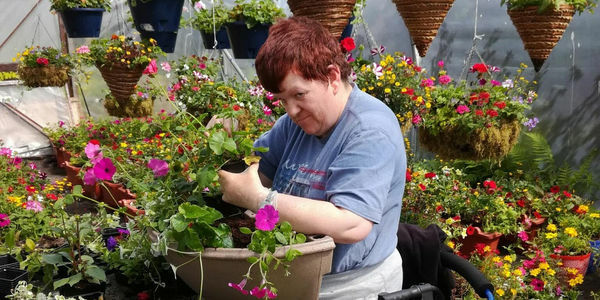 The users, who are learning disabled adults have been attending the Isobel Rhind Centre, many for over 20 years to take part in the garden project, which takes place at the centre outside and in the polytunnels. The project also provides over 100 planters for the town centre of Invergordon. At the end of last week the project leader, who is employed by Highlife Highland, who sub contract this project to the NHS, was told the project funding would cease in January 2019. Today she told some of the garden users and they were devastated. Carol Forbes, who has been attending the project for over 10 years said, "If it closed the NHS are for the high jump because I want it to carry on forever and ever and ever." Malcolm Smith, who is one of the lead users for the garden said, "People get of their beds for this project and without it they won't bother getting up in the morning. It is so good for socialising. Some might commit suicide without a reason to get up." Bruce MacLennan, another fan of the project commented, "I will just sleep in my bed if I couldn't come here. I would lose my mind." Others gave similar contributions. The project involves training and experience in many aspects of gardening and provides structure and socialisation, which would often be lacking in the 16 users' lives. They get involved in: bird houses, grass cutting, growing, vegetables, hanging baskets, hedge cutting,i nsect hotels, making compost, painting, garden furniture, planting bulbs, potting, pruning, sawing logs, seed sowing, social enterprise, taking cuttings, weeding, illlow weaving and xmas wreaths. For the users of this project it is a way of life and they would be lost without it. It only costs the NHS around £38-45 per user per day and they will save around £40,000 if they close the project down, by paying off the staff who run it. This is small change compared to the cost to the NHS Scotland, if the health of these uses is affected because they have no reason to get up in a morning. Please support this petition to encourage the NHS to reverse this crazy decision. Public support for the work the Isobel Rhind Centre do is paramount.